Calvin Coolidge was the 30th President of the United States. As the nation's 19th Vice-President, he took the office of President upon the death of his predecessor, Warren G. Harding. It seems only fitting that someone who is destined to become President should be born on the 4th of July. 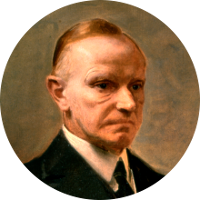 Such was the case with John Calvin Coolidge who was born on 04 July 1872 in Plymouth Notch, Windsor County, Vermont. His parents were John Calvin Coolidge, Sr. and Victoria Josephine Moor. His father was a Vermont politician who served in both the House of Representatives and the Senate for the State of Vermont. President Coolidge was a skilled and effective public speaker. He held over 500 press conferences during his presidency, which was a record at that time. Despite his expertise at giving speeches, he became known as "Silent Cal" during his presidency due to the stories of his being an extremely quiet man in private. One such story has author Dorothy Parker ("A Star is Born") seated next to him at a party. Aware of his reputation, Dorothy said that she had bet a friend that she could get more than two words out of him. His reported reply, "You lose." Another story tells of how Mrs. Coolidge, too sick to attend church on Sunday, asked her husband upon his return what the sermon was about that day. The President's reply, "Sin." Not willing to accept his short answer, she pressed on asking him what the minister had said about sin. His reply, "He was against it." The ancestry of President Coolidge is quite extensive with most of his ancestors tracing back through colonial New England. Due to this fact, his family connections to other famous people are quite numerous. Some of his closest connections are to passengers of the Mayflower and to people that were convicted, and in some cases, executed for witchcraft during the 1692 Salem Witch Trials. President Coolidge has some interesting political connections as well with relations to numerous former Presidents, as well as a relationship to the 2012 Republican candidate for President and former Governor of Massachusetts Mitt Romney.